The most visited webpage on the internet is, without the shadow of a doubt, Google.com. It is thus the most interesting advertising avenue and Google is best placed to know this. However, it has kept the page's pristine white look, only supplementing it with a doodle every now and then, and new About and Store shortcuts in a few countries. But from time to time, Google uses the power of its homepage to advertise its own products. We've seen it with Allo, Duo, the Pixels, and now it's happening with the new Pixel Slate too. 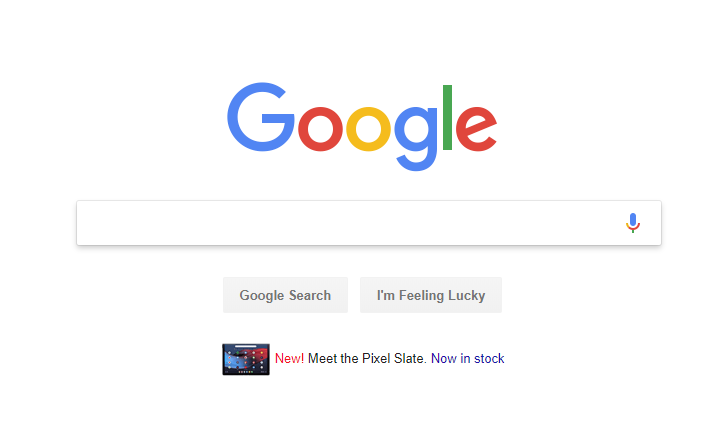 If you live in the US and head over to google.com, you're likely to be greeted with a small notice below the Google Search and I'm Feeling Lucky buttons. An image of the Pixel Slate, a red "New!" to get your attention, and a link to buy it on the Google Store are there. It's not much — it's certainly not like Amazon's huge banners for its products — but it should get a few more eyeballs to check the new Slate. David already shared some of his thoughts on the Chrome tablet and came away both liking its future prospects and not very impressed by its current state. His full review is coming up, but in the meantime, we suggest you think well before buying the Slate. A $700 Pixelbook (the price has dropped again on Amazon) seems like a much wiser investment if you ask me.